The Staatskapelle Dresden never disappoint in Germanic repertoire and so it proves here, with a very 'standard' selection of Wagner Overtures and Preludes. The number of recordings that shuffle the pack of these Pre-Ring works; adding Mastersinger, leaving out Rienzi with the occasional Siegfried Idyll for variety's sake, is legion. Here Berlin Classics have opted for a straight reissue of an early digital/1984 selection from the last days of LP which makes for a fairly stingy sub-52 minutes of music. Conductor Hiroshi Wakasugi is a good interpreter in a centrist way - I cannot remember any moments which stick out in a musical sense for good or ill, although that is not as negative a comment as it might first appear.. The main glory is the actual sound of the Dresden orchestra. The brass have a weight and roundness to their sound that is a joy to hear. In 1984 the East German woodwind still had a tonal individuality that is less evident in brand new recordings - both the oboes and clarinets have that edge of plangency that I really like. The strings are a remarkable collective group with superb ensemble and attack with body to spare. The Lukaskirche Dresden is the reliably sympathetic recording venue which helps with the weight of sound the orchestra produces, although I did find myself wondering whether the early digital recording gave the sound an occasional metallic brightness that I do not always associate with the orchestra or the venue - the very opening of the Act I Prelude to Lohengrin is a case in point - beautifully sustained and phrased though the string playing is. Once the strings descend from the ‘in alt’ opening this is another very attractive performance. The concert closes with a rather heroic version of the Lohengrin Act III Prelude. Certainly Wakasugi does not press the tempo for maximum virtuosic effect but this allows the lyrical second subject to have a very appealing lilt. The heavy brass make a suitably brazen sound at the Prelude’s end but then the recording is rather spoilt by a short and abruptly cut-off final chord. This is a strange choice for the recording studio and/or the editing thereafter and mars the ending. 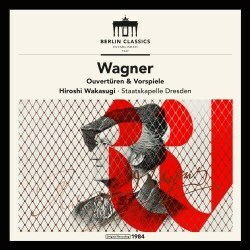 The relative recentness of this recording prevents it having the historical worth and interest of some of the other releases by Berlin Classics, brought out as part of their 70th anniversary. The liner is perfectly good, the cardboard bi-fold sleeve is acceptable if hardly premium quality. So, something of a modest reissue but one that celebrates a great orchestra in music they have in their bones. If your collection can stand the duplication this is worth consideration if not an unequivocal recommendation.